One of my favorite Friday dinners is homemade calzones. They’re easy to make, usually cheap, and an easy way to include kids in the meal preparation. I frequently use ricotta cheese as a filling since I can pick it up cheaply at my local grocery outlet. Last time, I bought a 16 oz. container for $.59. I add in pepper, salt, and dried basil, all to taste. If you want to make your own ricotta, Mark Bittman’s How To Cook Everything: Simple Recipes for Great Food has a simple ricotta recipe using buttermilk. To start, I make my pizza dough in the bread machine using the pizza dough cycle which is only 55 minutes. Another option is to use the Dough Cycle, usually 1 hour and 30 minutes. If you don’t have a bread machine, use an electric mixer and double the recipe and freeze half the dough for another time. 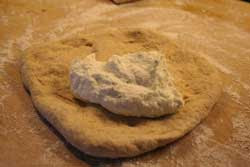 On a floured board, I divide the dough in half, and then divide each half into quarters. I roll each quarter into a semi-formed ball in my hand and then flat the ball to form a seven-inch round. Laying the round on the floured board, I plop about 2 Tablespoons of filling towards the bottom of the round. After I fold the top part of the round over to form a half moon, I use the tines of a fork to press the edges together. I never press along the fold. 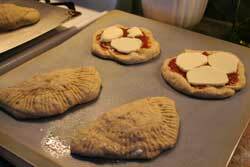 The calzones go on a greased cookie sheet and bake at 375 degrees for 20 minutes. 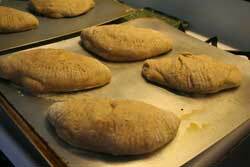 If I am not rushed, I will brush the top of the calzones before baking with olive oil. Some of my kids like to dunk parts of their calzone in a bowl of homemade tomato sauce; others prefer to have the sauce drizzled over top. This time, I ran out of ricotta filling and made two rounds into mini pizzas. This helped me use up some mozzarella from the fridge that was getting a little old. To add veggies to the dish, in addition to the tomato sauce, I throw in crumpled up dried kale or dried greens. Hi I am visiting from Tasty Tuesday, these look great!